All the following cases can be modified to suit your personal specification. Please contact us for a quote. 19" Rack Cases L/O F & B 2U to 6U cases are made entirely from 6.5mm black Hexaboard, and have hydrid aluminium extrusion on front and back edges, with 25 x 25mm aluminium angle covering side edges. 2U to 3U cases have lids secured by large, padlockable drawbolt catches, and have strong ergonomically shaped handle on front lid. 4U & larger cases have lids secured with butterfly catches and lift-off hinges on each lid. All cases over 6U are made entirely from 9mm black Hexaboard, (except for lid facings which are 6.5mm), similar spec. to above, but with 30 x 30mm angle on all edges. 19" Rack/Mixer Cases (L/O FB&T): are built to house a 19" rack mount mixer on top of a conventional rack-mount case. A full 2U is allowed for the mixer height, and all lids have an internal clearance of 55mm (2 1/8"). 2U & 3U cases: have lids secured by large, padlockable drawbolt catches, and have a strong ergonomically shaped handle on front lid. Construction is 6.5mm black hexaboard throughout, and have 25 x 25mm aluminium angle to all external edges. 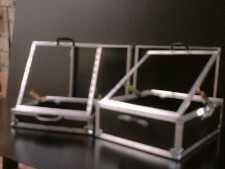 4U & larger cases: have front & back lids secured with butterfly catches & lift-off hinges; 2 x butterfly catches on top lid. All cases over 4U are made entirely from 9mm blace hexaboard, (except for lid facings which are 6.5mm), similar spec. to above, but with 30 x 30mm angle on all external edges. Sleeves can be cut to any size required, up to a maximun of 483mm(19"). 19" Shock-Mount Cases: made from 9mm hexaboard, complete aluminium extrusions and fittings, completely surrounded by 25mm (1") thick hi-impact, shock absorbing plastizote foam. H/D rubber suspension mounts are embedded into foam on base to enhance shock resistance and prevent 'sinking' of sleeve. On larger cases, the same mounts are also embedded in top of case, thus maintaining a tight and fully suspended inner rack at all times. Large H/D corners and braces are fitted to the external case, with recessed handles (min. of 2) All the suspended cases are extremely robust and add an extra dimension to the protection of professional equipment. 19" rack with "Pop-up" mixer on tilt cases: Normal lift-off front, back and top. Mixer positioned 'flat' for transport, but can be raised to any angle for 'in use', by the implemention of a multi-position ratchet system. 2U allowance for mixer. The above range can be "customised" to any requirements you may have. Extras available 2" Castors full swivel & swivel with lock 4" Castors full swivel & swivel with lock All castors can be fitted direct onto case or onto 'skids' or onto a "dolly" board. They can be fitted to base of case, or onto back lids. Shelves; drawers; shelf & amp supports; rack strip at back; side-facing rack; blank plates; non-rack cradles; venting etc. are also avaliable + lots more.